Hypoallergenic carpet pad- No more allergy! A hypoallergenic carpet pad could be the answer for allergy sufferers who want carpeting in their home or office. Combine this with an air filter or air purifier, as discussed at TheGoodAirLady.com and you may find yourself breathing easier. Carpet padding can harbor a wide range of allergens that can be reduced with the use of a hypoallergenic carpet pad. Allergy sufferers often have a hard time living in a home with carpeting. Dust mites, dander, dust and other allergens settle into carpet and its padding, causing allergy symptoms that are hard to get rid of. This is one reason why most people with asthma problems prefer not to have carpets at home despite them wanting it badly. Even if they go ahead and buy one, who is going to clean it? It is a known fact that you are susceptible to dust and other allergens while you are cleaning. These concerns force a lot of people to stay away from it. But, do they really need to? There are safer alternatives as you will soon find out. Most people assume that it is the carpeting that is the problem, but it may, in fact, be the carpet pad and/or the moisture that it comes into contact with in the carpeting. This realization has led many companies to manufacture a hypoallergenic carpet pad, so that even allergy sufferers can enjoy the warmth and comfort of carpeting in their homes. What do you need to consider when you are looking for a hypoallergenic carpet pad to be installed in your home? You first need to realize that the term “hypoallergenic” does not mean that there will not be any allergens. Hypoallergenic means that the item causes less allergic reaction, or reduces allergic symptoms. There is really no way to guarantee that there will be absolutely no allergic reactions from a specific item, simply because each person is different. These differences are what make us so special, but it also is a problem when dealing with allergies, because it is hard to determine what levels of a particular allergen can be tolerated before an allergic reaction. So if someone tries to sell you these carpet pads saying that there will be zero allergens in your carpet from you now on, they are simply bluffing to make a sale. In the carpet world, a hypoallergenic carpet pad usually includes a moisture resistant property that helps to make the carpet pad anti-bacterial, anti-microbial, and anti-fungal. Depending upon the manufacturer, you may find slight differences between one company and another, but these are the main allergens that the padding is resistant to. And if recent researches are to be trusted, most of the people are allergic to these stimulants and by effectively preventing them from settling on to your carpet, you stand a very good chance of enjoying a carpet in your home without having to worry about allergies. Anti-bacterial means that the carpet padding is resistant to bacteria growing in or on the carpet padding. This helps to keep bacteria growth down, which can exacerbate allergies or asthma. It is equally important to limit the moisture content in the carpet to keep away bacteria and other microbial organisms. It is a known fact that such organisms thrive when there is a moisture presence. Anti-microbial means that the carpet padding is made to resist the growth of any type of microbe, including bacteria, fungus, viruses, and other microbial growth. Anti-fungal means that the carpet padding keeps fungus from growing in or under the padding. A hypoallergenic carpet pad is also normally completely synthetic with no animal or plant fibers that can cause allergy symptoms. While there are some naturally occurring substances that are naturally hypoallergenic, they are not commonly used in the manufacturing of carpet padding. The chemicals that are used in creating the hypoallergenic pad are inert, which means that they will not outgas or decompose, either. Also, there is no harmful effect to the environment resulting out their use. All of these factors add up to create a carpet pad that is safe for allergy sufferers to use in their home. If you or a member of your family suffers from allergies or even asthma, you will want to consider hypoallergenic carpet padding when you have carpet installed in your home. By using this type of carpet pad, you are helping to protect your family from as much of the allergen exposure as possible from the carpet padding. Every little bit that you do will add up to help in decreasing allergy and/or asthma symptoms. This article does not say anything about HOW to clean carpet, when the dust and dirt filtering into carpet. Does such pad disolve dust? If people have allergy to dust, for example, dust at first should be removed from carpet, from apartment. Partly dust will be dwelling on the surface of carpet untill it is vacuumed twice a day. There is a recomendation for people with astma or alergy to dust – bare floor! bare floor should be wiped twice a day. How pad helps? And how much dust or dirt pad can take in? The intent of the article wasn’t to talk about how to clean carpet. It’s an educational piece about what hypoallergenic carpet pads are. Dust can’t really be dissolved. It can be trapped or removed though. And it can be separated from other things that make it worse. You are absolutely correct in your comments about how allergy sufferers can best live with carpets and padding — by not having it. But if people want carpet they want to know about the various pads available to them so they can make the best purchase decision. Who makes it. Are there any brand names. Which would you recommend. Rubber would qualify as a hypoallergenic carpet pad. I don’t have any specific brands or manufacturers to recommend. There is nothing allergy friendly about carpet or carpet pad period. Carpet and pad release VOCs, trap dust, and put loose fiber in the air. I have been in the business for 20 yrs. Carpet industry is highly unregulated, and seldom ever tested. Stay away from carpet and pad if you have sensitivity. Jesse, I agree, but some people insist on having carpeting. You are absolutely correct in your comments about how allergy sufferers can best live with carpets and padding — by not having it. But if people want carpet they want to know about the various pads available to them so they can make the best purchase decision. The moisture barrier is actually a good thing. If there is moisture in the basement, it will help to keep it from getting to the carpet. Actually, what you need to do is make sure that the basement floor — I’m assuming it’s concrete — is sealed with a moisture barrier. You can find more info here. Even better is to NOT use carpeting at all – carpeting is great at trapping allergens. 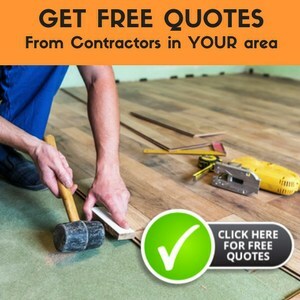 You might want to consider vinyl or linoleum, ceramic tile, a floating engineered wood floor, etc. You can even paint or stain the concrete if you choose. Does the basement ever experience water problems or just the general dampness that is so common in a basement? The basement seems dry for the most part now. When I moved in the house had a swamp cooler and the dryer was not vented to the outside. There was high humidity down there for sure. That has all been corrected. As far as a moisture barrier on the floor, part of the floor is covered with old VCTs. would this act as a mositure barrier? Other parts of the basement, however, are just bare concrete. The old vinyl composition tile might work as a moisture barrier, depending on what was used as an adhesive. There are other types of moisture barriers you can use on the areas where you don’t have any – you can find out about your options at the portion of the site. My wife, and daughter, suffer horribly from allergies. And she, the wife, wanted carpet in the house….once we got new carpeting put in and used a pad from ACS, their allergies decreased drastically, at least in the house. Along with the filters we use. You can have carpet, just do research online. There are companies out there that specialize in this stuff. Using hypoallergenic rug pads will help reduce risk of allergens getting stuck in the rugs. Proper cleaning and maintenance should also be practiced to maximize this effect.